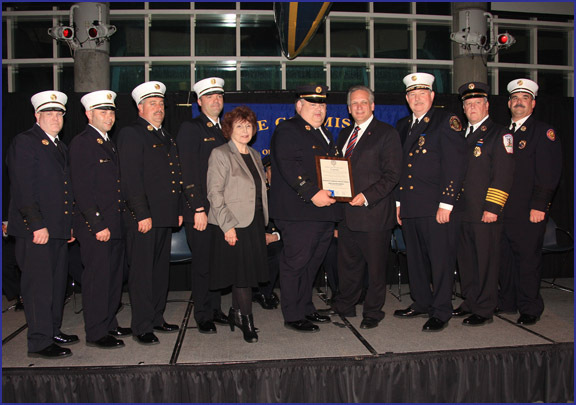 Presiding Officer Norma L. Gonsalves recently attended the Nassau County Fire Commission Annual Awards Night Ceremony at the Francis X. Pendl Memorial Nassau County Firefighters Museum and Education Center in Garden City. The ceremony is held to honor various Departments and Fire Officials from all over the County. At this years’ ceremony, Ex-Chief Walter Griffin of the East Meadow Fire Department was given the EMS Award for his actions in resuscitating an infant who had not been breathing. Other awards such as the Silver Medal of Valor, the Emergency Medical Service Award, and Unit Citations to specific Fire Departments were given as well. Pictured (l-r): Joseph Lennon, 3rd Assistant Chief, East Meadow Fire Department; John McGee, 2nd Chief, East Meadow Fire Department; James Kane, 1st Assistant Chief, East Meadow Fire Department; Robert Salvesen, Chief, East Meadow Fire Department; Presiding Officer Gonsalves; Ex-Chief Walter Griffin, East Meadow Fire Department; County Executive Edward Mangano; Ronald Magarie, Vice Chairman, Nassau County Fire Commission; John Gillen, Nassau County Fire Commissioner, 6th Battalion; Scott Tusa, Chief Fire Marshal, Nassau County.